Row 1 (L to R): S. Epperson, E. Hines, K. Lupo, M. Bretz, M. Hall, L. Page, R. Shelhamer, C. Croswell, F. Welch, C. Farmer, P. Fitzgerald, J. Brooks, C. Badie, D. Reichner, S. Megas, J. Wohletz. Row 2: R. Masterson, J. Hansen, P. Couper, R. Lorenzo, S. Claunch, H. Evans, V. Mioner, M. Potter, L. Trees, D. Fournier, S. Taylor, J. Lara, G. McNamara, J. Gray, S. Denson, T. Mautino, M. Booth. Row 3: A. Clark, V. Harris, W. Trachim, R. Weigand, R. Noble, D. Helenbrook, R. Rheaume, C. Wakeman, T. Ellenberger, R. Mittwede, A. Singletary, K. Seaman, D. LaPoint, A. Burbage, M. Keil, J. Deex, P. Riley. Can anyone pinpoint the date? Sometime between November 1982 and March 1983. 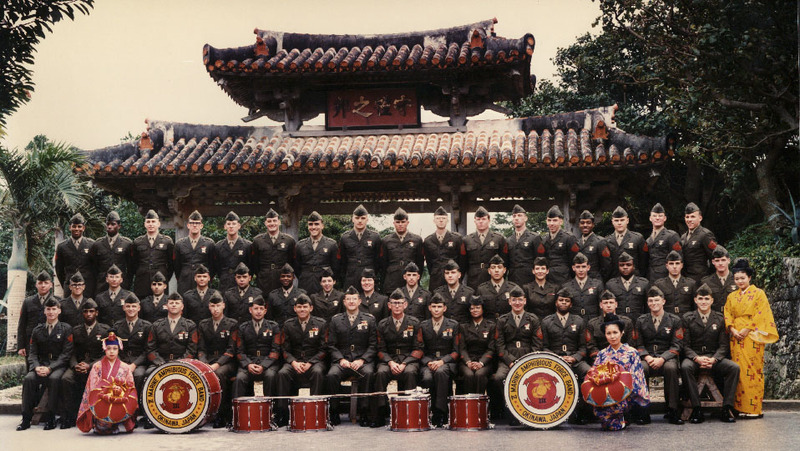 This band photo was taken on Okinawa in front of the Shurei-mon near Shuri Castle. Click here for a web page that gives a history of the castle and the area around it.